Be careful about bringing your beer to a Destructoid room party! They might claim they don’t know you, and then keep your beer! Sean tells Vinnk about his time at MAGFest, the fun panels he attended, the cool people he met (and re-met), the awesome videos he watched — like JewWario’s trailer for his new FamiKamen Rider series, and how Sean would go to a Destructoid room party again (even if he has to bring more beer to get in). Discussion about the MSX also re-ignites the debate of what can or can’t be considered a game console. Sean shares a couple of items from his MAGFest haul! This year he procured a Family Keyboard and Famicom Data Recorder from Mad-Gear. It’s a pretty cool, really strange peripheral that saved game data for a very small number of games before the Famicom Disk System came along and stole its thunder. This will definitely be covered in a future episode of Famicom Dojo, but until then enjoy this quick hardware preview, and imagine the gaming possibilities with sequential magnetic tape! While Sindra and Sean were off at MAGFest 2013 this past weekend, Vinnk held his annual Vinnk-Con. This year it is much expanded with new guests, new rooms, and more expanded content for attendees to enjoy! 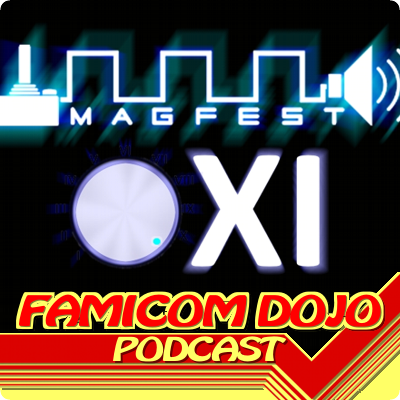 Take a look, and enjoy until we get our MAGFest coverage completed for your viewing entertainment. Another year has gone by and another MAGfest is upon us. Last year, Sean Orange and I made the trek to MAGfest X to take part in the 4-day music and gaming geekery that surrounded us, and this year we’ll be doing another round and taking in all the highlights (and even maybe some hilarious lowlights!) that the event has to offer. This year features 3 special guests in terms of composers. Following up last year’s spectacular appearance by Final Fantasy’s Nobou Uematsu, MAGfest XI has the legendary combined talents of Kuniyo Yamashita (Castlevania, MegaMan X3), Chris Huelsbeck (Turrican Series, R-Type) and the great Yuzo Koshiro (Streets of Rage, Actraiser) gracing the Gaylord National Harbor hotel. This will also be the first time Koshiro will be playing a DJ set in US shores, which provides event-goers with an extra special treat! There are a huge amount of bands and performances this year as well; 38 concerts and visual performances to be exact! (the largest amount thus far!) Included in the lineup are mainstays such as Metroid Metal, The One-Ups and The Megas, but also included are a ton of new-comers to the MAGfest scene such as Lords of Thunder, Fighting in the Streets and The Tri-Force Quartet. There’s even band-personifications of two of the better institutions for video game music arranging: Overclocked Remix’s Overclocked University and Dwelling of Duels Live! Throw in tons of panelist and entertains like Arin “Egoraptor” Hanson, The Angry Video Game Nerd and yet another return by Jon St. John, and you’ve got the most ambitious MAGfest to date! The event runs January 3-6 at the Gaylord National Harbor Hotel, Maryland with tell that there are tons of tickets still available at the door. Sean and I will bring coverage of the fun little things we run across at this gamer’s paradise and bring it to you for your viewing enjoyment.